PORTLAND, the United States, June 27 (Xinhua) -- For over 30 years, Henry Diphillipo has lived a simple life on a wharf in Portland, the most populous city in the northeastern U.S. state of Maine, following the routine of unloading and sorting lobsters. At the intervals of greeting and seeing off lobster boats, Diphillipo would turn on his animatronic fish and listen to the two tunes the Big Mouth Billy Bass sings: "Don't worry, be happy!" and "I Will Survive!" Yet lately, Diphillipo, who has dealt mostly with local consumers, can't help worrying that the lobster industry, one of the major pillars of Maine's economy, would bear the brunt of the negative consequences of the brewing tariff conflict initiated by the Trump administration and targeting the United States' major trading partners including China, which mainly imports lobsters from the states of Maine and Massachusetts. In response to the U.S. threat of an additional 25-percent tariff on Chinese imports worth about 50 billion U.S. dollars earlier this month, China has announced that additional tariffs for 545 items worth about 34 billion dollars, including agricultural products, vehicles and aquatic products, will be effective from July 6. Over the past three decades, the price for lobster bait grew from 25 to 225 dollars a barrel. The fishermen were not alone in expressing concerns that Maine lobster will be losing its hard-earned shares of a fast-growing Chinese seafood market if the tariff bluff becomes real. China imported about 128 million dollars worth of live lobsters from the United States in 2017, according to Wisertrade.org, which tracks international trade. China accounts for 15 to 20 percent of the export value of U.S. lobsters, Annie Tselikis, executive director of the Maine Lobster Dealers' Association, told Xinhua. "The tariffs will impact almost everybody in Maine as people in the state are more or less involved in the industry," she said. According to Tselikis, there are roughly 4,500 licensed lobster catchers in the state of Maine and about 10,000 to 12,000 people are directly employed in the industry. If the tariffs are imposed, Tselikis said, the U.S. lobster industry will further lose its edge over its arch rivals in the business, such as Canada. Canada struck a trade agreement last year with the European Union (EU) that will cut tariffs on lobsters in five years. "With the China tariffs, ...the Canadians then will have an advantage in the Chinese market. So that's frustrating for us because competing in a disadvantaged market will be challenging," said Tselikis. The lobster industry in Maine is considered not only a critical part of the state's economy, but also its history and heritage. The way fishermen throw out traps and harvest lobsters and the way wholesale and retail companies sort and keep live lobsters today remain almost the same as 30 years ago. However, the geographical distribution of consumers has changed drastically in the past decade. While Maine lobsters mainly went to local and European markets in the past, a large amount are exported to the Chinese and other emerging markets. Lobster exports to China increased from 719,000 dollars in 2007 to about 128 million dollars in 2017, statistics show. Maine Coast Lobster Company in York, Maine is a perfect example of the success stories which catered to the skyrocketing Chinese demand for premium seafood. "We've seen tremendous market growth in China and expect to see more in the future," the company's founder and CEO Tom Adams told Xinhua. Established in 2011, Adams' company has grown 125 percent over the past three years. Last year, it shipped more than 7 million pounds (3,175 tons) of live lobster to 29 countries, including China, with a revenue of 57 million dollars. When Maine Coast began shipping to China in 2013, it only earned around 1 million dollars. China is the fastest growing market, Adams said, adding that his company has customers in China's big cities such as Beijing, Shanghai and Guangzhou. "We're incredibly excited about the business we've done and the potential growth going forward," said Adams. 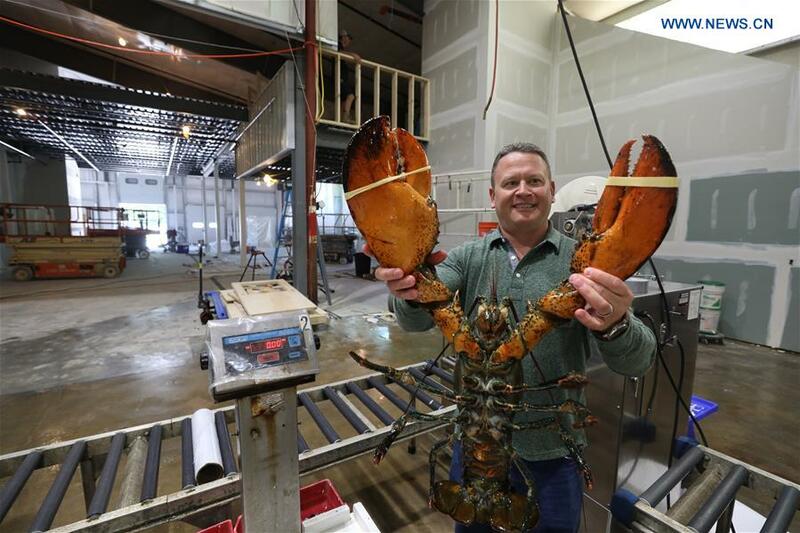 The middle-aged entrepreneur said he is concerned about the direction of U.S.-China trade relations, yet believes that Chinese demand for Maine lobsters will keep growing. The Canada-EU trade agreement which enables Canada to sell lobster to the EU with zero tariffs has "drastically" affected the company's sales to Europe in 2018, according to Adams. If trade tariffs between China and the United States take effect, the Maine lobster industry could suffer, said Adams. The congressional delegation in Maine has warned that the potential tariffs conflict with China would jeopardize the state's lobster industry that is "an irreplaceable part of our state's economy that supports thousands of jobs and entire coastal communities." Congresswoman Chellie Pingree sent a letter on June 19 to Deputy U.S. Trade Representative C.J. Mahoney, urging the administration to pursue a more coherent trade strategy to save the state's economy from further uncertainty and harm. "While there are certainly issues that warrant rethinking current trade policy, the alternating and conflicting trade decisions made by the administration seem to be doing more harm than good in Maine," Pingree wrote in the letter. "All of these issues outlined above make me very worried about the long-term negative consequences for Maine businesses," said Pingree. "To save our state's economy from further hardship and uncertainty, I urge the administration to pursue a more coherent and methodical trade strategy and to weigh the potential repercussions carefully before taking further action."